There are even more reasons to go to a professional auto repair shop in Peoria. In addition to the reasons we covered previously, You will maintain the manufacturer’s warranty. A lot of manufacturers are very particular about the warranties. They usually outline terms and conditions, and they often state that performing transmission repairs will void this warranty. This means that if the vehicle breaks down, the manufacturer will not help to service it, as the warranty will be null and void. However, if you take the vehicle to a certified professional, the manufacturer’s warranty will remain intact. 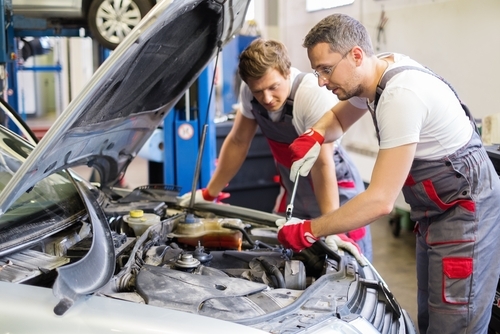 Some professionals may even have training from specific manufacturers, and they will know how to properly fix the vehicle without voiding the manufacturer’s warranty. Repair shop warranty protection is another consideration. Another benefit of working with a repair shop is that they can offer you a warranty on the transmission repair services. This means that you do not have to pay any more money in case a mistake was made. You can simply take it back to the repair shop, and they will fix it right. The warranty usually lasts for quite sometime, and it affects the exact parts of the transmission that had an issue before. This is very different from taking the DIY approach. In case you try and fix your vehicle on your own, and you make a mistake, you will pay even more in order to fix it. Therefore, fixing your transmission on your own can be a very costly endeavor. An auto repair shop can properly fix automatic transmissions. Manual transmissions were slightly easier to fix than the transmission of modern automatic cars. A car owner who tries to fix their automatic transmission vehicle may encounter a lot of problems. This is because a lot of these car systems rely on computer chips and software systems that operate the entire vehicle. Even if the car owner follows a repair manual, they may find it difficult to properly repair their vehicle. Automatic transmission vehicles require a lot of training and a lot of practice in order to fix them. Fortunately, professional repairmen will have the necessary training and skills to do this job perfectly. They have probably practiced their techniques on several automatic vehicles, and their have perfected this type of transmission repair. You can therefore trust them to do a good job and to ensure that your vehicle is up and running in no time at all. So be smart. Go for professional auto repair in Peoria.